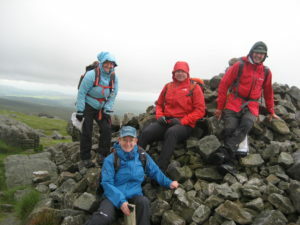 Seven Bremex members had a fantastic weekend in the Yorkshire Dales at the end of June. We were based in Kettlewell, which offers a great choice of hill and valley walks directly from the village, with no need to drive anywhere. As well as being one of the prettiest villages in the Dales, Kettlewell has all the amenities a walker needs, including a YHA hostel, a campsite and a well-stocked shop, not to mention three pubs. 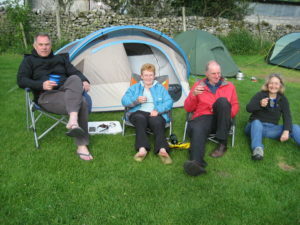 One person opted for the comforts of the hostel, while the rest of us stayed at the pleasant and well-run campsite, where we had our own designated area in the top corner of the field. 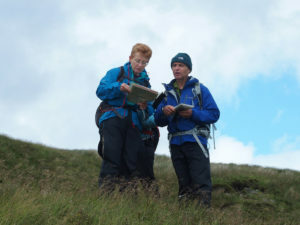 The focus of Saturday’s activity was a navigation challenge. The route, which had been pre-planned by the weekend organiser, was divided into about a dozen sections, each leading to a recognisable feature, such as a junction of streams or a ring contour. We took it in turns to lead, learning from each other’s styles of navigation. A climb through the fields on the east side of Kettlewell brought us into rough open country to approach Great Whernside (704m) by an unconventional route. 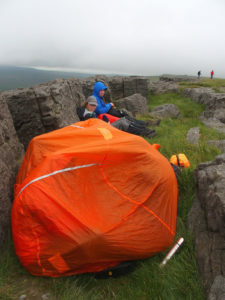 It was cold and windy on top, but we needed to eat, so were glad of the protection afforded by the jumble of gritstone boulders at the summit. For additional warmth we made use of one of the group shelters that are standard items of safety equipment on all Bremex expeditions. 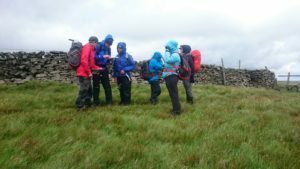 We now started to encounter a lot of people taking part in the Wharfedale Three Peaks Challenge – an annual fundraising event for the Upper Wharfedale Mountain Rescue team. 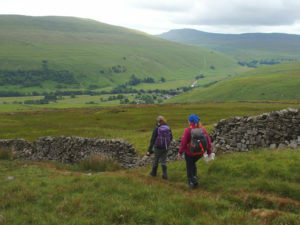 The 22-mile circuit from Kettlewell takes in Birks Fell (610m) and Buckden Pike (702m), as well as Great Whernside, and is an alternative to the more famous Three Peaks of Yorkshire (Pen-y-Ghent, Whernside and Ingleborough). Whernside and Great Whernside, by the way, are not to be confused. 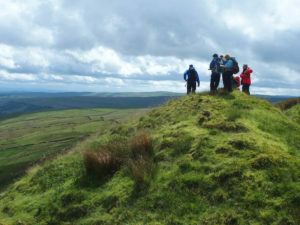 The latter hill, despite being honoured with the adjective ‘great’, is slightly lower, while Whernside, at 736m, is in fact the highest peak in the Yorkshire Dales. We descended to the top the minor road that climbs steeply from Kettlewell up Park Rash and leads over into Coverdale. We then continued to Cam Head, where four people returned directly to Kettlewell, while the other three took a longer route, descending to Starbotton, then returning to Kettlewell on a lovely path through woods and meadows with an array of flowers including agrimony, self-heal, hawkbit, birds-foot trefoil, milkwort and heath bedstraw. On Saturday evening, after pre-prandial drinks at the campsite, we repaired to the Blue Bell Inn, where we had good beer and tasty food. Some people are under the misapprehension that this establishment is named after the flower that carpets woodlands in springtime, rather than a ringing thing, but of course Bremex people are always well informed so we knew better. Sunday saw a progressive improvement in the weather. 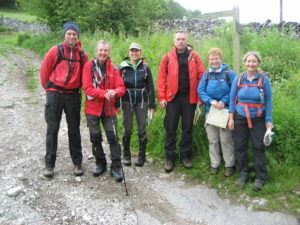 The whole group stayed together to do a 10-mile walk over into Littondale and back. Again we took it in turns to lead, although the focus now was on completing the walk within a reasonable time rather than finding specific features. Bremex would normally use the 1:25000 map for this kind of exercise, but throughout the weekend we relied mainly on the 1:50000 map, which does not show walls and fences, and therefore encouraged us to concentrate more on the contour lines and other natural features (see video below). 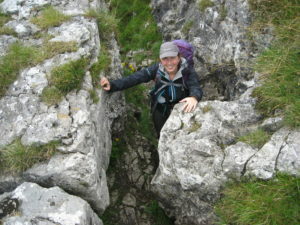 Our route took us up the fellside on the south side of the village to climb through the ‘slit’ – a distinctive gap in the limestone outcrop. We then followed the ridge of Old Cote Moor northwards to reach the summit of Firth Fell and just beyond that the bridleway that goes over from Buckden, in Wharfedale, to Litton, in Littondale. Near the summit we heard the plaintive ‘peep’ of a golden plover. It is one of many waders that migrate in early spring to the high pastures and moors of the Dales to breed. Other birds we saw or heard over the weekend included curlew, snipe, lapwing, oystercatcher, skylark and wheatear. In Litton we stopped at the Queen’s Head for drinks and sat outside in warm sunshine to eat our sandwiches. It was a marked contrast with our lunch experience of the previous day. The two-mile section of the walk along Littondale, following the River Skirfare with the ancient wood of Scoska just above, was a delight. It was a shame to pass through, Arncliffe, an even prettier village than Kettlewell, without stopping, but time was pressing, so we carried straight on over the ridge to return to Kettlewell and commence our journeys home.